In my opinion, good chocolate is its own food group. A little bit feeds the soul and fires the imagination. I want people to experience the real thing, without lots of sugar, and other ingredients that most people confuse with the taste of chocolate. Real chocolate is strong, earthy, fruity, floral … a whole world that unfolds on your palate. It’s the deepest, densest tropical jungle mixed with the refinement of Paris and the sheer wonder of childhood. Chocolate, in all its mysteries and complexities, is my passion. I suppose it was fate that my parents, Ray and Lucille Ambrosius, gave me the perfect name for a chocolatier. I grew up as one of ten children on a dairy farm in Seymour, Wisconsin. With that many mouths to feed, Mom was usually found in the kitchen creating something wonderful for us. Chocolate pudding was one of my favorites, so much that I have a truffle named after my Mother that tastes just like her chocolate pudding, made on the stovetop from scratch. She instilled a lifelong love of cooking in me. While Mom introduced me to warm, comforting chocolate, Paris introduced me to dark, exotic chocolate. I was 17, on a French Club school trip, and got separated from my group for a day. Along with shopping and an impromptu hair cut, I visited the patisseries. Everything was so beautiful, I just wanted to eat it all. I remember watching the people eat chocolates and they were in ecstasy. So I bought my first dark chocolate and I understood—eating this is the best thing you can do. I dreamed of owning my own chocolate shop, like the ones I’d seen in Paris, but life often has other plans. I moved to Madison, married, had a son in 1988, divorced, went back to school, became a cartographer, and took a “safe” job with the State of Wisconsin where I worked for a decade. Then I got laid off. I was 44, unemployed and a single mom. It was scary, but it was also my opening. A chance to live my dream. With the support of family and friends, I decided to go for it. 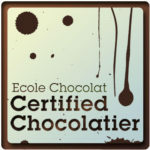 I took an online class with the Ecole Chocolat and then returned to France, where I learned the craft from the renowned Valrhona and Cluizel chocolatiers. While in France, I visited neighborhood shops, unabashedly sampled lots of world-class chocolates and soaked in as much information as I could gather. I came home with nearly 50 pounds of chocolates! 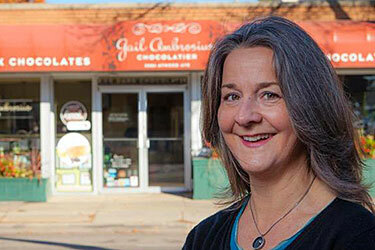 Just before Thanksgiving in 2004, I launched Gail Ambrosius Chocolatier. I hired my first employee within six months. Today, I employ 10 people and together we produce several thousands of pieces of chocolate by hand every day during our peak seasons. After much study, experimentation, tasting, practice and practicing some more, I have come to understand a bit more about chocolate. I am still far from being an expert. I like to think of myself as a lifelong student. There will always be more to learn and understand. Dark chocolate is more interesting because you get more of the real chocolate taste without lots of sugar. Single-origin chocolate is even more interesting because it takes on the flavors of the area where it was grown. Chocolate is an adventure; it comes from exotic locations, circling the equator, all around the globe. Don’t be shy about trying lots of chocolate. I try everything I can in order to explore all the varieties of flavor that the amazing theobroma cacao tree has to offer. There’s no right or wrong. If you like it, that’s great. If not, keep tasting and eat what you enjoy. As my business grows, it seems I’m drawn back, more and more, to the farm. In recent years, I’ve traveled to a few of the countries where cacao is grown. I’ve lived with the farmers and seen agroforestry and biodiversity in action. 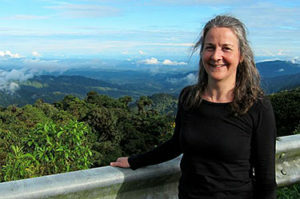 Although Seymour is half a world away from the jungles of Costa Rica, I’ve lived the farming life and I understand it. And now, here I am using cacao they’re growing and selling it as a gourmet product. I feel passionate about using quality chocolate that is grown without chemicals. Real chocolate—grown on trees by farmers transformed into truffles on wintry Wisconsin days—is my passion. And it’s my joy to share it with you.